In 1995, Ronald George Williams’ granddaughter Emma Hay completed an English Negotiated Study at The Friends School, Hobart, Tasmania. Entitled ‘A Fortune Teller Who Knew Her Stuff’, the study is published in full. 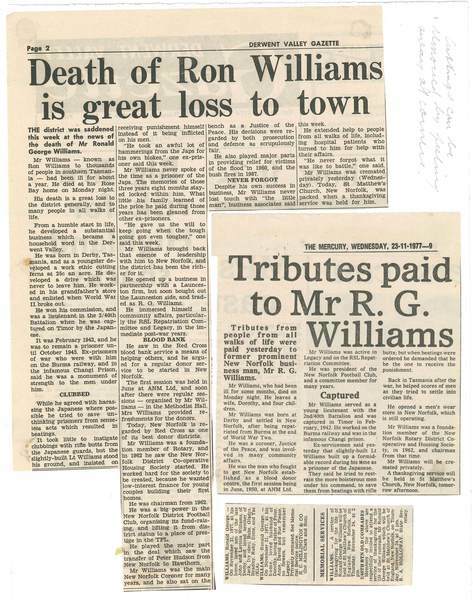 Ronald George Williams, my maternal grandfather was the seventh child of John James Williams and Lavinia Mary Williams. He was born on the 7th August 1920 in Derby, in north-east Tasmania, into a poor, but happy, loving family of eight children. His father worked the tin mines around Derby. Ron was educated at the Derby State School, and was a bright boy, he won a scholarship to attend the Scottsdale High School, but due to the Depression and his family’s poor circumstances, he was unable to accept the scholarship, so completed only primary school, then went to work to help support the family. Firstly he worked in a drapers shop and trapped rabbits to sell for extra money, then moved to Ringarooma to work in the General Store – where he met my grandmother Dorothy Annette Wardlaw – later they became engaged. 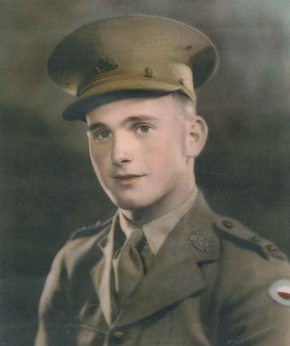 At the age of 20 Ron enlisted into the Australian Army, it was 1941 and World War II had been raging for over two years and Australia had began to send troops in. 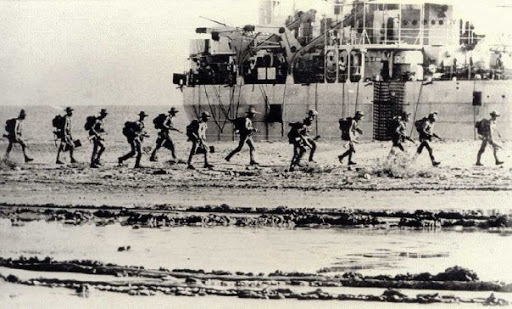 Ron and his battalion were ordered to move out and were shipped to Timor with associated smaller units, as part of Sparrow Force, immediately after the Japanese attacked Pearl Harbour. 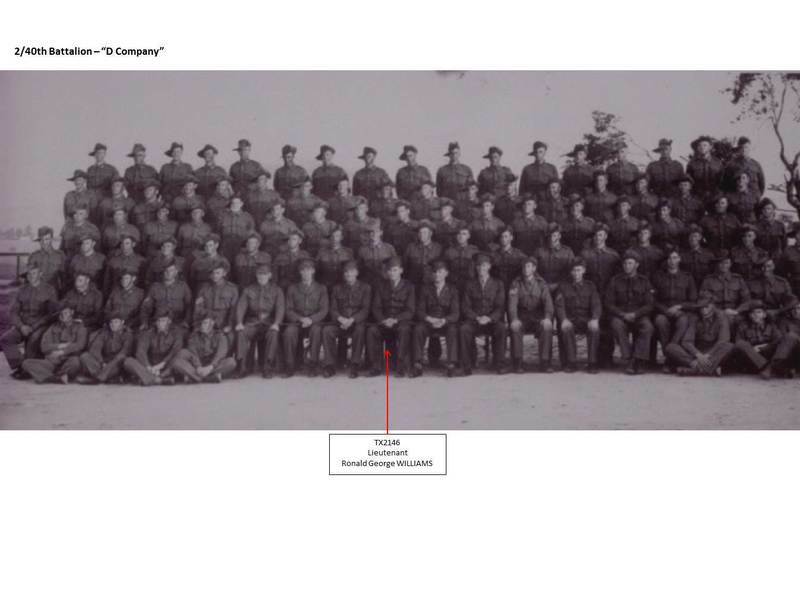 THIS IS NOW THE STORY OF THE 2/40TH BATTALION AS MY GRANDFATHER MAY HAVE TOLD IT. 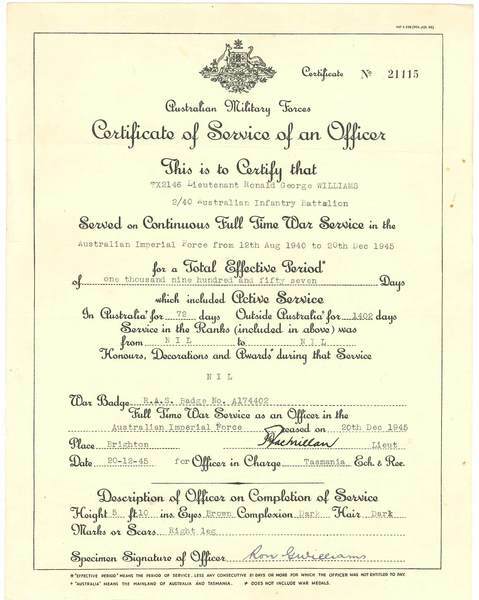 We were on Battalion parade in Darwin on 7 December 1941 and our troops were told their orders for embarkation on the HMAS Zealandia the next morning, for a destination unknown. Our emotions were confused, we were disappointed at missing out on our long awaited leave after a hard year of training, working our way up through central Australia to Darwin and the excitement of finally leaving Australia to fight for our country, but we were suspicious that we would be occupying an isolated outpost and not be part of the main action. We were a large group of men with physical labouring skills from country districts. The ships did not leave until 3am on the 10th December, because the wharfies were on a go slow strike so it took two days to load supplies on board. The weather was stifling. We arrived in Timor on the 12th December at 10.30am to see a rocky, barren coral island except for white, sandy palm fringed beaches. Our two ships, the Zealandia and Westralia dropped anchor in Koepang Bay and we were greeted by dozens of outriggers and canoes manned by curious Timorese. We were ferried from the ships in barges to the beach at Oesapa Besar, a village about 6 miles east of Koepang. The only jetty in the bay was made of stone and coral and the bay way very shallow, so it was a tedious and difficult job ferrying men and stores, a job which took 3 days. We tried to bribe the natives with food to help us with the unloading which was urgent, but they were unhelpful. Some of our valuable wireless sets had been lost or seriously damaged by mishandling on the Darwin wharf and at Oesapa Besar and this loss of equipment was demoralising. 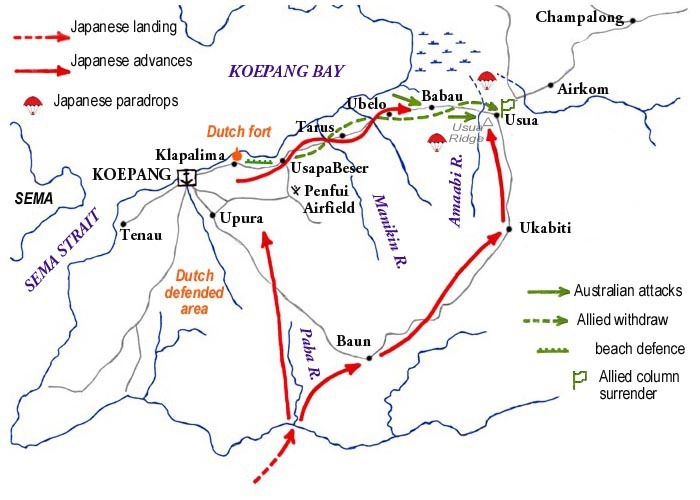 We established camp at Penfoei, near the airfield, about 3 miles inland from Oesapa Besar, and about 3 miles by road from Koepang. The men had wood and thatched huts with cement floors. The officers’ mess and quarters were on the highest point of the area ideal from a scenic and tactical viewpoint looking out over the aerodrome and the Bay of Koepang and beyond. Our quarters were quite luxurious compared with our primitive barracks in north Australia. 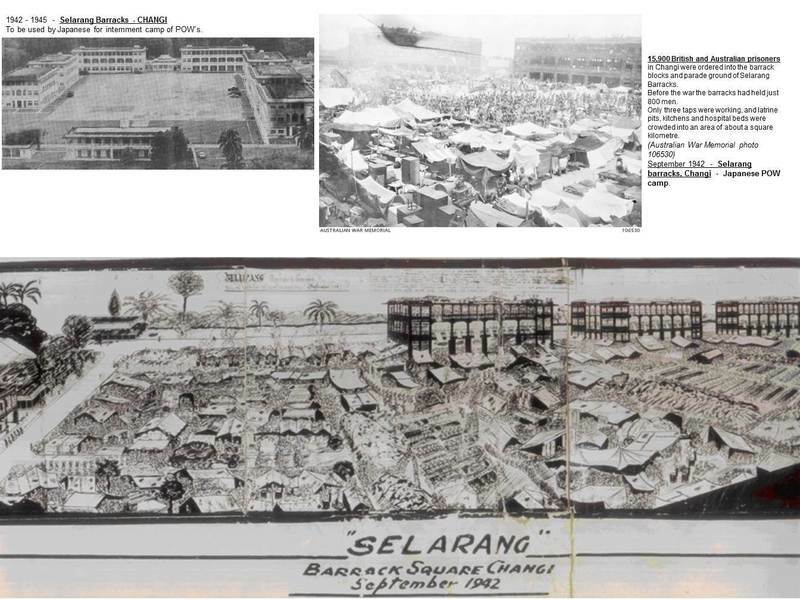 D Company, to which I was assigned, was given the task of being a mobile reserve and from 16 December concentrated on reconnaissance of the area surrounding the main defensive area from Babau and Oesaoe to the east of Koepang and Baun in the south and from the 28 December we were based at Babau. We were worried about the serious deficiencies in equipment and ammunition to carry out our task, should the need arise, but this had been a concern since the beginning of our training. At one time, at the Brighton camp, we had 12 rifles in camp, six were used by the guards and the other six left, meant that only six soldiers could train at one time. Lieutenant Colonel Leggatt, our Commanding Officer on Timor wanted more machine guns, medical supplies and other stores as well as trucks, we were greatly under strength, as were other battalions and units in the area. Leggatt asked the Australian authorities for more supplies. The Dutch on the island were also poorly armed and were responsible for covering a wide area of coast. We received a small boost to our supplies in February 1942 of Tommy guns for the battalion, the most modern weapon available, but a gun my men did not want to use, as they had not had any training with it. Our soldiers started bartering with the natives for more food, swapping their possessions for food and other goods. Some were swapping their winter underwear for bananas. Malaria was a big problem as we were in very infectious malarial areas. We tried to remedy this with appropriate clothing, mosquito nets and medicines but had little success. Our first bouts knocked us unconscious. In the early days of the illness we were unsure what was going on, being from Tasmania, we had no knowledge of Tropical diseases, and our doctors were little help. Tropical ulcers too were prevalent. Our cuts and abrasions becoming infected quickly. Instructions were given that all wounds, no matter how small, were to be treated with iodine, but many became infected, leading to ulcers. Healing was hard to achieve on many cases and bone was quickly exposed. The infection was often just scooped out with a spoon. Our postal service from home was poor, and there was a lack of beer and cigarettes. Morale was getting low. At Christmas we had received word the Japanese were preparing to attack with some force, and our strength was weakened by the fact that the Dutch were withdrawing from Timor, and the onset of the wet season was also a hindrance. In mid-January a squadron of American warships arrived without warning and boosted our morale, only to leave the following day, leaving us wondering about our vulnerability to a surprise attack from the sea. Requests were continually made for reinforcements, we just had insufficient troops and ammunition to defend the island, until finally on about 19 January our 2/40th Battalion was increased by 145 men and other units in Dutch Timor by 73, but many of these men were untrained, having been in the army only 6 weeks and never having fired a rifle. This placed added strains on us all, because not only were they badly trained, but they arrived with old South African Boer War equipment, and so we had to give what surplus equipment we had to them and had little opportunity to further their training. We were becoming increasingly aware that the Japanese were active in Timor, gathering information through the Timorese natives and Chinese agents. The natives cut our telephone lines which caused great inconvenience, but it was difficult to determine if it was sabotage. On Australia Day, the first shots at the Japanese were fired, two soldiers saw seven planes fly overhead and the leading plane opened fire over the airfield, this was the first indication that we were in the active war zone. 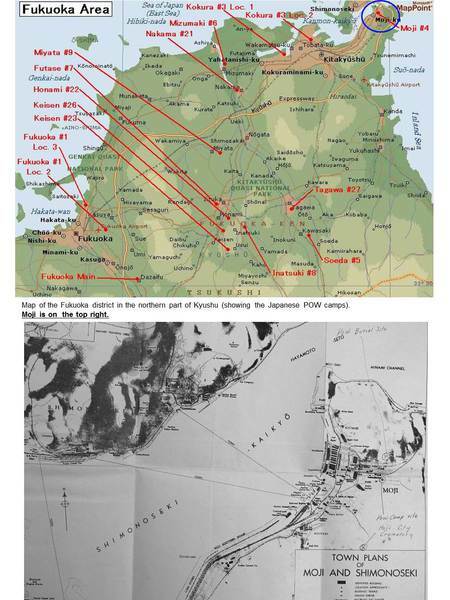 The Japanese bombed and sent down heavy shell fire without opposition from the Allies. 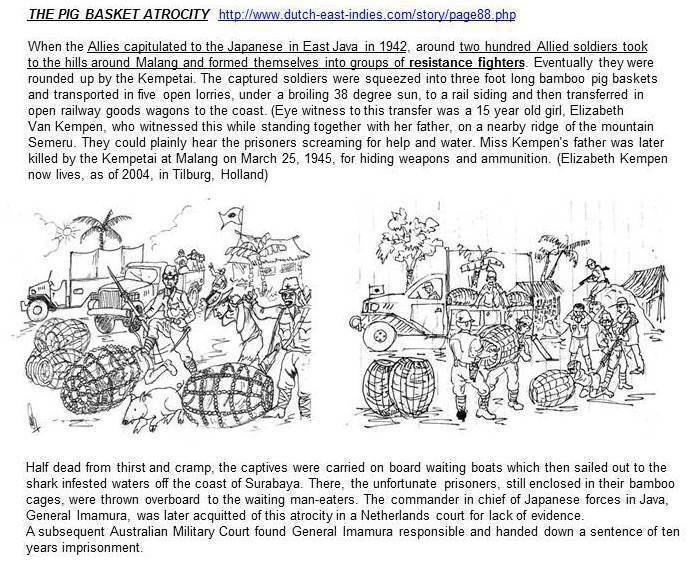 They attacked shipping in Koepang Bay, sinking some small boats and killing some Timorese. 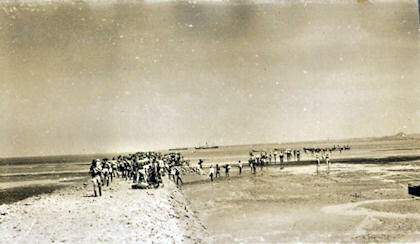 They destroyed 3 cargo ships and 3 Dutch flying boats, sheltering at nearby Roti Island. It was decided then not to fly the Qantas flying boat in from Darwin with supplies and mail as the trip was thought to be too dangerous, of course this disappointed the men. We realised we were in a hopeless situation if invasion occurred, as the Japanese attacks and reconnaissance by air were almost a daily event, coming often without warning. All this time D Company was becoming more and more familiar with the roads and tracks through the thick scrub in the surrounding area. which unsettled us. 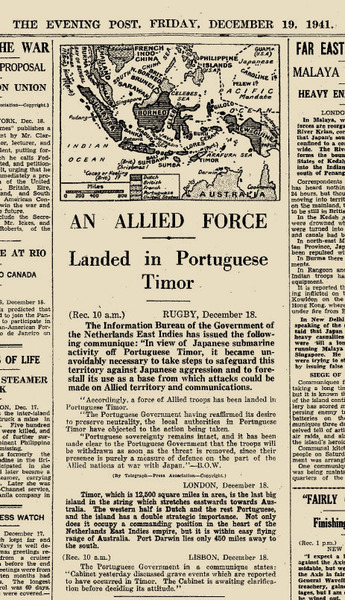 More reinforcements were turned back, which was a demoralising blow, and we had news that there were two enemy convoys nearby, a powerful naval force of 70 to 80 miles south of Timor and a large transport convoy coming in from the north. 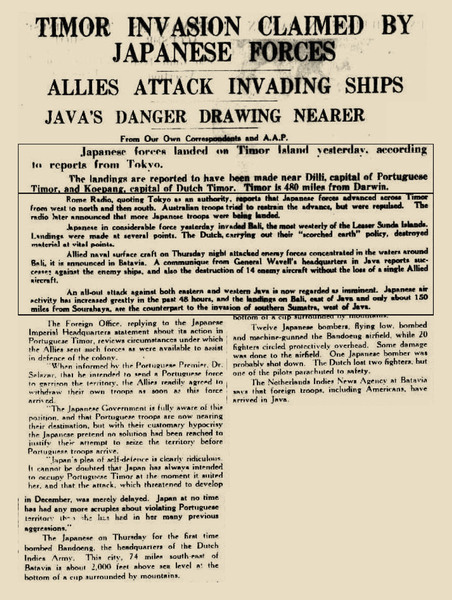 The Japanese fleet in the Timor Sea was the position from which the attack on Darwin began and was a foil for their attack on Timor a few hours later. The Darwin attack was designed so we would get no assistance from Darwin. 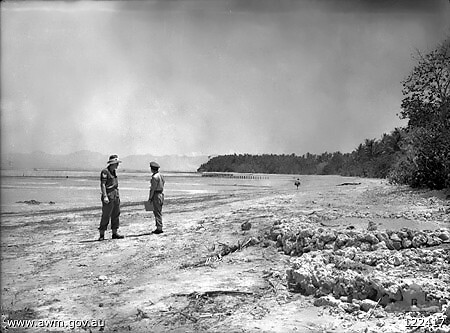 Enemy ships landed at Paha River, just after midnight, but were not reported at the time by the Timorese coast watchers. Their landing area was undefended, so it went like clockwork. We were unaware of the size of the landing, so could only assume the worst. The landing only being reported at 5am the following morning. 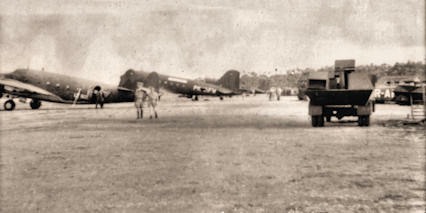 Leggatt gave orders to destroy Penfoei airfield. This was a huge logistical task working nights and our men were exhausted. D Company was ordered to move from Babau and occupy position on the Baun Road, in order to contact the enemy and report their movements. I moved my platoon by truck to a position 15 miles along the road from Upura, with spirits high but we were physically exhausted. We settle in near the road, in the low scrub, and we waited in the hot sun – annoyed by the flies. 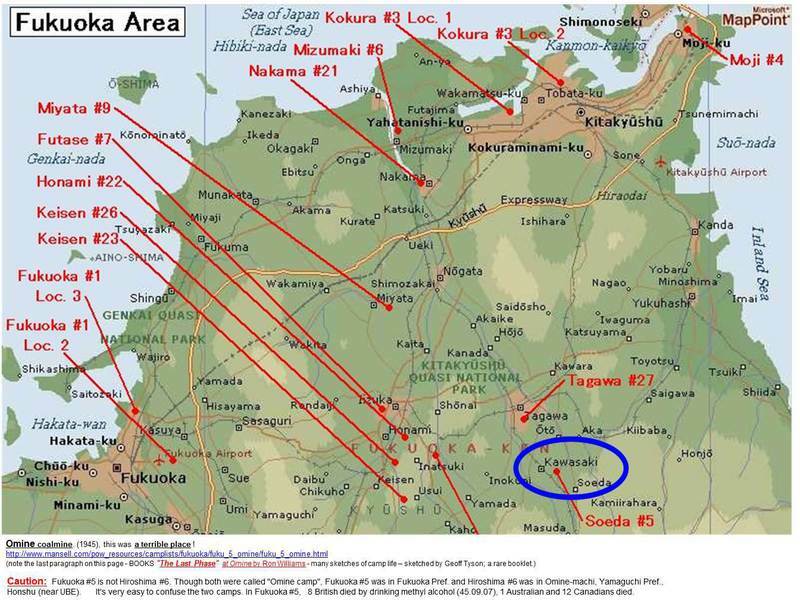 The whole of 2/40th Battalion was spread over a wide area, around Koepang. 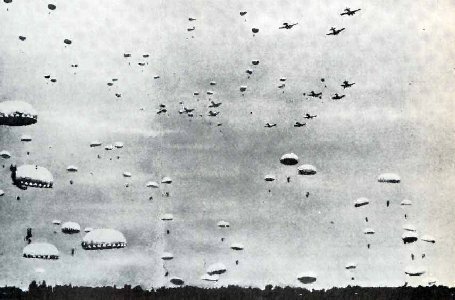 Meanwhile 500 Japanese paratroopers landed 5 miles north-west of Babau, where two weeks previously they had dropped one parachute. Leggatt radioed for us to move out, back to Babau, but the message was not received for some time. The paratroopers captured the small and ill equipped soldiers stationed near the landing area and took the soldiers prisoner. There was little our soldiers could do, but fight a delaying action until reinforcements arrived. The only men available to them were cooks and other headquarter staff, medical orderlies and patients not ill enough to be sent to hospital in Tjamplong. They had no machine guns, only rifles. We were eventually called to pull back to Babau and were carried by truck the 30 miles, travelling as quickly as possible along the narrow, winding single track road and passed through Koepang, Tarus and Obelo, before stopping several hundred yards to the west of Babau. We heard other platoons had suffered severe casualties defending Babau and we in D Company now found ourselves well in advance of the rest of the 2/40th with little means of communication and no protection. We knew we were out numbered 3 to 1. We advanced cautiously through Babau and it was here we had our first casualty coming face-to-face with the enemy and attempting to destroy a machine gun post. We had to resort to the primitive use of a runner as our means of communication, and sent him back to headquarters at Obelo and learned an inaccurate report that 17th and 18th Platoons were virtually destroyed and my 16th Platoon was seriously in trouble. We withdrew from Babau back along the road, water and morale were very low and we had not had much sleep. 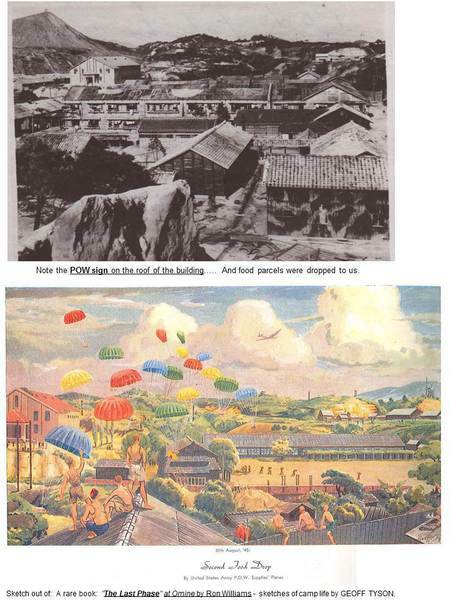 Japanese aircraft were everywhere and extra paratroopers were being dropped in. 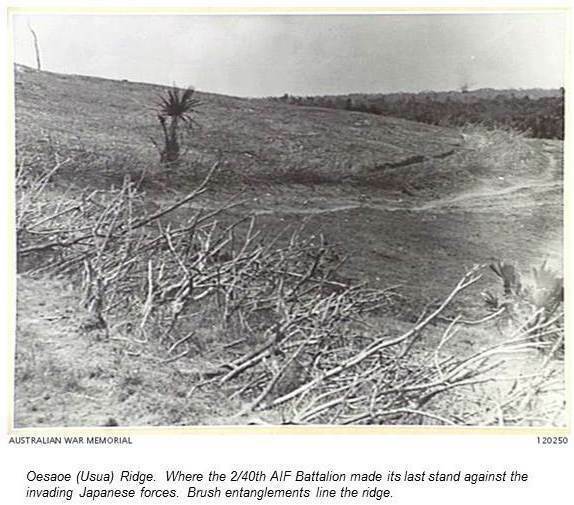 We took up position at Oesaoe Ridge after being ordered to go towards the Japanese at Koepang. All our trucks and food were at Babau which had been cleared of Japanese. Our orders were to protect the rear guard and the Japanese came in on our rear. We withdrew to Obelo, we fought off the paratroopers and pushed through to Airkom. It was dark, and we stopped to regroup. I organised a group to go back and find any wounded, as I was not sure if we had been cut off from the base hospital at Tjamplong. We held our position on the road and next morning, 23 February, a Japanese soldier came down the road carrying a white flag, a soldier was sent to meet him as we thought they wanted to surrender, but they wanted us to surrender. Japanese planes came over dropping bombs on us and their troops moved in and we were captured and taken to a Prisoner of War Camp after only 3 days of fighting. We were to learn later that only 78 paratroopers arrived in Oesaoe, an unknown number being killed in Babau. Sparrow Force killed more than 600 enemy troops in the three days of action from 20th to 23rd February and destroyed a number of enemy aircraft. Over the coming hours all units in the area agreed to surrender, but some men dispersed to the hills, some managing to spend weeks in hiding before eventual capture. It was never clarified how many Japanese troops there were on Timor, but some estimates were 23,000 there were definitely more than 3,000. After we were captured Australian airforce planes from Darwin flew over the area and sighted 18 enemy ships in the Koepang area. We stayed at Oesapa-Besar until September and we were made to work unloading ships at Koepang. We were taken there by trucks each day and the Japanese guards on the wharf were very violent, hitting us with sticks and gun butts. We left Timor on the 23rd September, on board the Dainichi Maru and made a short trip into Dilli. The 2/40th was split up before we left Koepang, but I tried to keep my platoon together as best I could. Whilst on the ship to Dilli, an Australian Bomber plane bombed our ship, but luckily the bombs missed, it was a very rusty ship and would not have survived a bombing. We left Dilli the next night and were taken to Surabaya on Java and were put on a train at around midday and taken to Batavia. 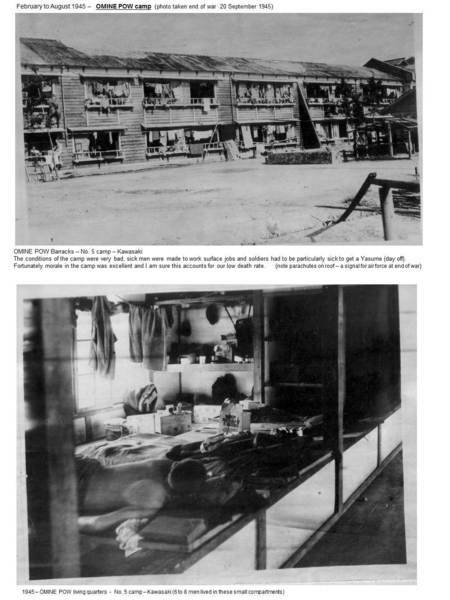 I remember the white Dutch women forcing their way through the Japanese guards to provide us with food and water on the train. I thought this was a very courageous thing to do. 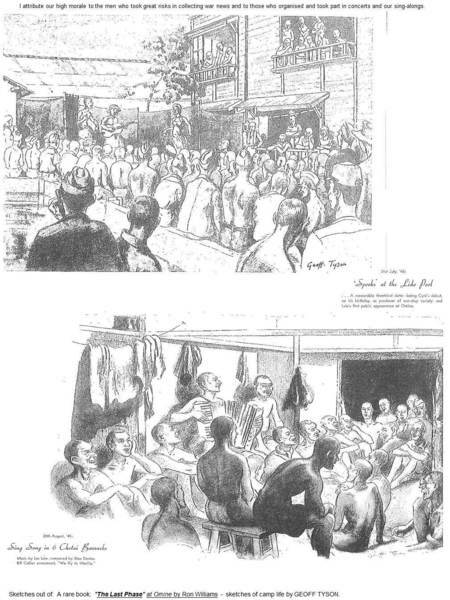 We arrived in Batavia at 12 noon, 1st October 1942, we were placed in a large camp called Tandjoeng Priok, which consisted mainly of ‘Tommies’, a name we gave to the English. I was put into number 8 sub-camp as an Adjutant, an assistant to the Commanding Officer. 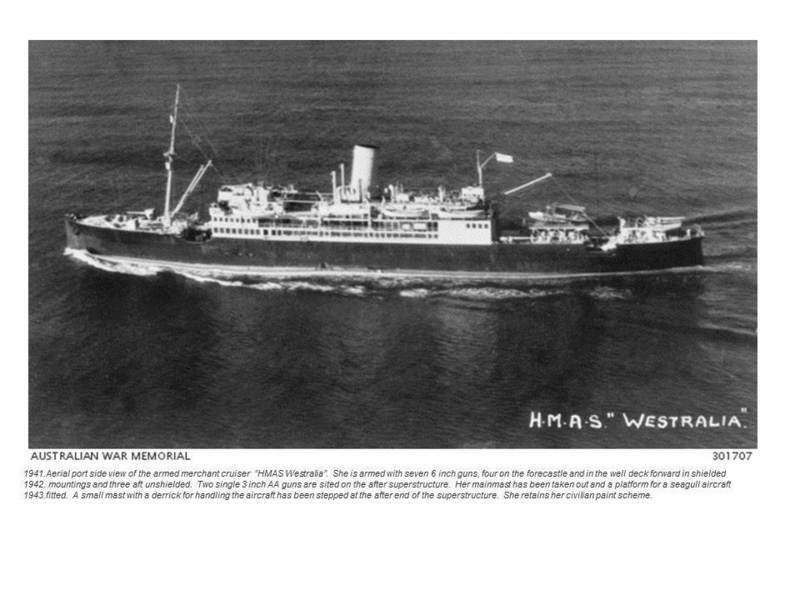 We left Batavia on 4th January 1943 and were taken to Singapore on the Wales Maru, and sailed into Keppel Harbour, Singapore, then transported to Changi Prison for 14 days. We were a pretty motley looking lot, bedraggled and so forth, which the British Prisoners of War took great exception to, and their Commanding Officer tried to enforce on us the British strict adherence to dress code and rules. Of course this put great tension between the two camps, the British and Australian, and made working conditions difficult when we were made to work side-by-side. Learning the rules of the Japanese often took us by surprise, we were continually saluting and bowing to them. Even men in sick bay at deaths door had to salute, if they did not they were often given a bashing. The enforcement of the saluting rules became a great problem for those men losing their eye sight. However, the shared attitude of other nationalities, the British, Dutch and so forth made us all develop lasting friendships. When we arrived in Changi, we were all suffering from malnutrition and when we moved on had to leave over 100 men behind in hospital. We were quite glad to move on as the treatment of Australian soldiers in Changi was appalling, we were not really accepted or treated well. We had come across Colonel ‘Weary’ Dunlop in Singapore and remember him haggling for more provisions of all sorts including medicines and clothing, he was disgusted about the poor quality of our boots I remember at one stage. On 21st January we left Changi by train and were taken to Bampong, the train was very cramped and hot. We were placed into small steel trucks, about 36 men to each truck, with little ventilation and no place to lie down. It was especially difficult for those men who were ill with dysentery or malaria. We were given only bananas to eat. 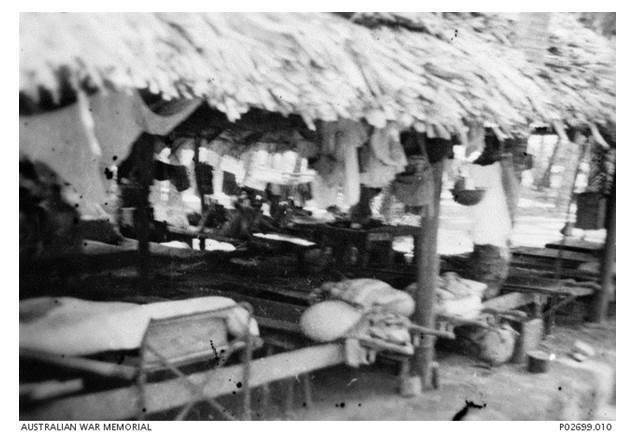 From Bampong we were taken further north to Tasoa where the camp was in appalling condition, no facilities and all prisoners developed dysentery and the weather was bitterly cold. Baskets of rice were thrown down into the filth and from that horror camp we were marched to Kanu, then on to Tiger Valley at Hintok. We were told it would be our permanent base camp. There was no camp there at all, just a bamboo jungle and we had to cut clearings out of the jungle, and build the campsite. We built a pipeline of bamboo to run water from a creek, and we had to light fires at night, around the camp, to keep the tigers away, but we never saw any tigers. 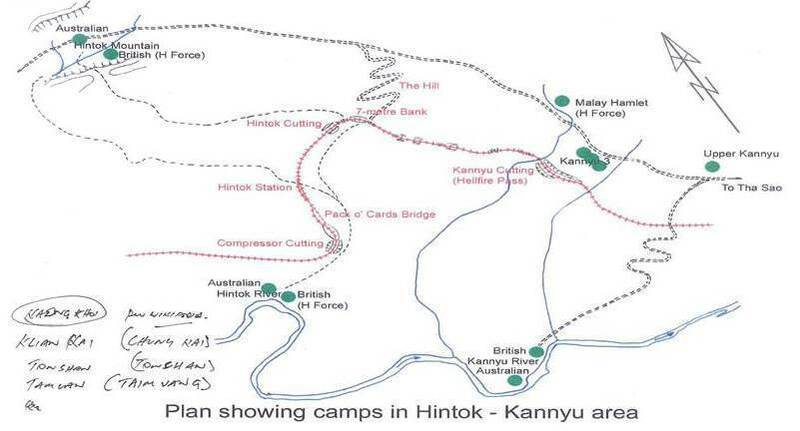 We walked 17km to a large camp at Kinbayonk, called Jungle One and it was here I got a bashing from the Japanese guards when one of my men was being unfairly treated, so I took his punishment instead. It was here we learned a sense of humour would help us survive the terrible conditions and treatment. We commenced work on the Burma -Thailand railway and life was really grim and conditions appalling, often we were working waste deep in mud. My work gang was used to clear the railway track of timber. British troops were not use to outdoor work and they suffered very badly and many died. Any troops too ill to work were taken back to a camp at Tasoa. Cholera hit us at Jungle One and a lot of men died. 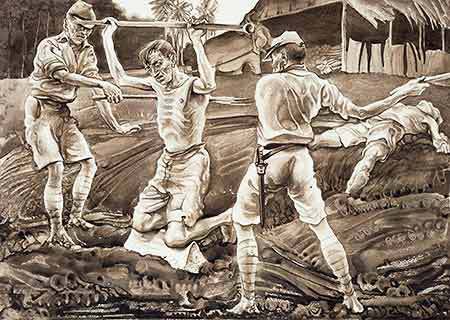 The Japanese guards were brutal and treated the weak and ill badly, lashing out for no reason with beatings and confinements. Our staple diet was rice and watery soups we were all so sick of this menu and we tried any means to obtain extras from the natives and stealing from the Japanese. Some soldiers risking their lives to steal vegetables, fruit or chicken. We were then taken by barge up river to Krian-Krai (August 1943), and we lost 6 men in a rock fall when putting a railway cutting around the side of a very steep hill. We were made to work from daylight to dark and would rarely get a day off, but thank God, on 17 October 1943 the line finally joined. Rest days were called ‘Yasume’ – meaning holiday in Japanese. 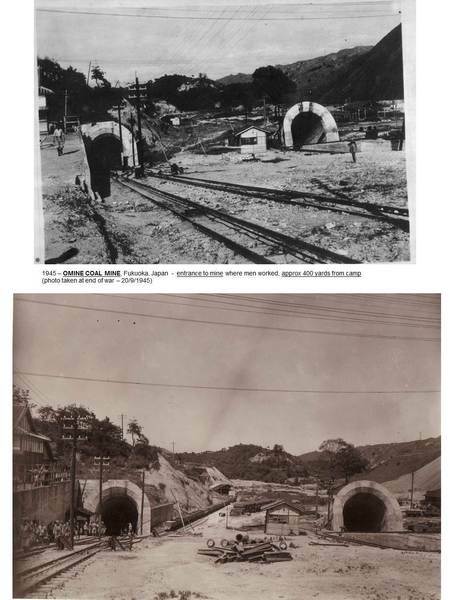 When we finished this particular section of the railroad, the Japanese put on a ‘Sports day’ for us. I organised a 5,000 yard race between runners from the Australian and British camps and the Japanese guards. We found two men whom we thought were still fit enough and good enough to beat the opposition – which they did. On Melbourne Cup day the first Tuesday of November we even decided to run an imaginary horse race. We used imaginary names and breedings for horses and jockeys. My good mate Denny Scanlon and another bloke gave a boxing exhibition and received a tin of biscuits from the Japanese as a reward, this was a surprise to us all. I organised a sick fund to help the sick who were sent south to Tasoa, and sent Denny and a mate escorted by a couple of Japanese guards to buy food and take the money south to our sick men. The men were very grateful and it gave them some hope. 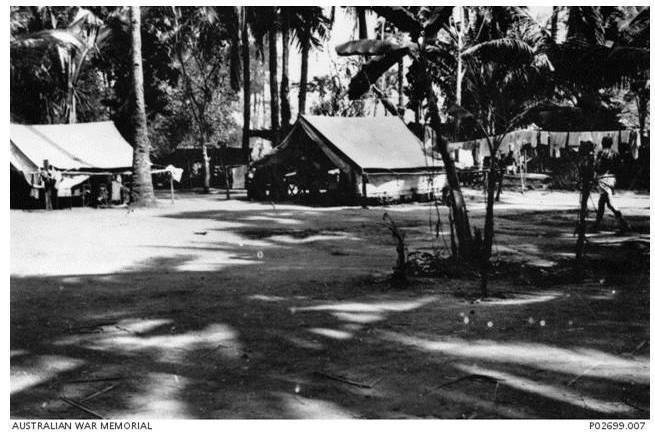 We moved south to Tampi Tonghang and I remember this camp because the commandant there had us build him a duck pond. We were there for 4 months. Our soldiers were becoming very ill from malaria and were just skin and bone from malnutrition. From here we went to a very large camp at Tamuang and we divided up into smaller and different groups and were taken to Singapore arriving late June at the River Valley camp and from there we were shipped to JAPAN. 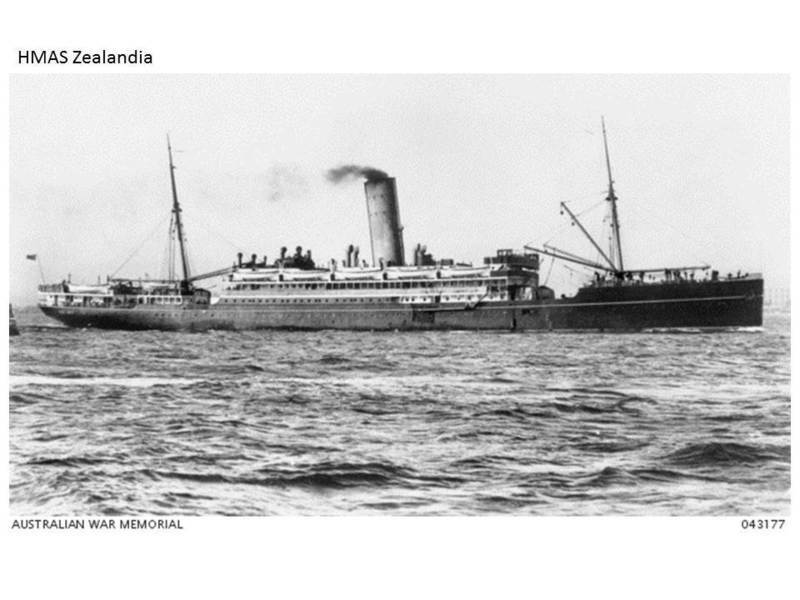 There were 911 Australian and 152 Dutch prisoners of war on board. 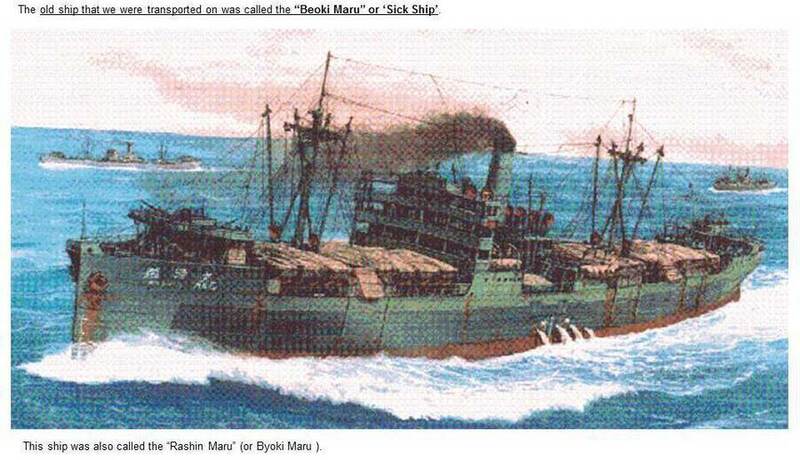 The old ship that we were transported on was called the Beoki Maru or Sick Ship. It had no bridge and the deck had collapsed. It had suffered a very bad fire and it was assumed it has been badly bombed. It was lightly laden with little ballast and it took 70 days to get to Japan. On the way we spent a week in Manila Harbour and were not allowed off the ship. Every now and then they turned hoses on us to wash us down. There were so many flies the guards had us each catch ten flies a day. 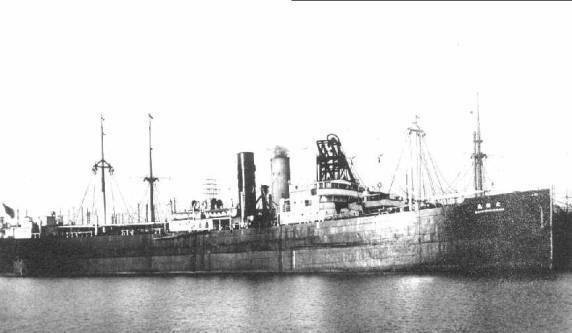 We left Manila and proceeded up the west coast of the Philippines and we were the lead ship in the convoy, because we were the slowest. We were very ill with malaria, dysentery and beri beri, while quinine was in short supply. One day whilst we were on deck, we watched 3 or 4 ships behind us torpedoed. Then a typhoon hit us, which was horrific, and we had to shelter between two islands. Since that time I have had an absolute fear of wind storms and have even sat up at night, not sleeping if a storm is blowing. Well, eventually we arrived at Moji, on the Japanese island of Kyushu, by which time there were only a couple of dozen of our 2/40th men together. We were taken to Saganoseki to work at a copper smelter where we unloaded copper ore at the wharf which was not such a bad place to work. Our camps were the best to date, but the food was not so good. We had two civilians in charge of us, who were reasonably good, and one guard who looked after us very well, even taking some of our men to his home for a meal. After the war I received a letter from one of these guards, wishing me all the best. A letter I have always cherished. I received a second letter the following year. 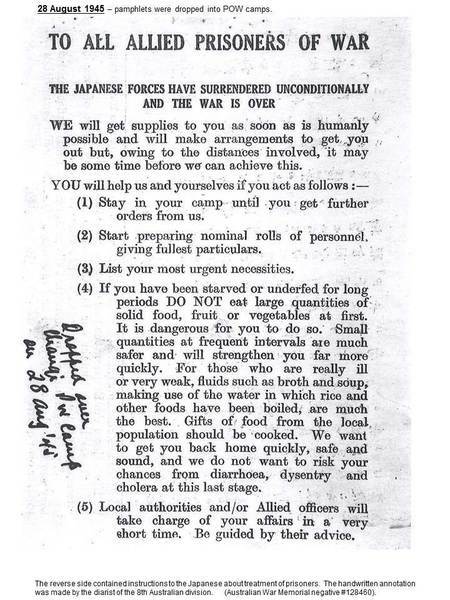 The Japanese were becoming war weary and their morale was breaking down through the news of defeats, lack of food, clothing and most necessities. It was obvious the country was becoming weakened. Many times the American planes flew overhead and we were forced to go into air-raid shelters and these were the first times we realised the Allies were fighting back. 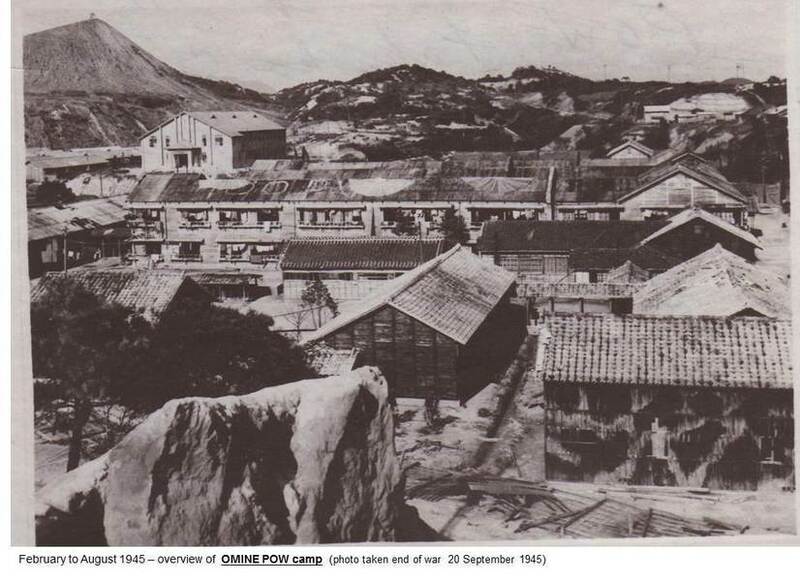 We then moved back to Omine coalmine, this was a terrible place. There were about 700 Prisoners of War, Australians, Canadians, British, Dutch and Americans, a very mixed bag of soldiers, sailors, airmen and civilians, and we were all herded together to work the mine. 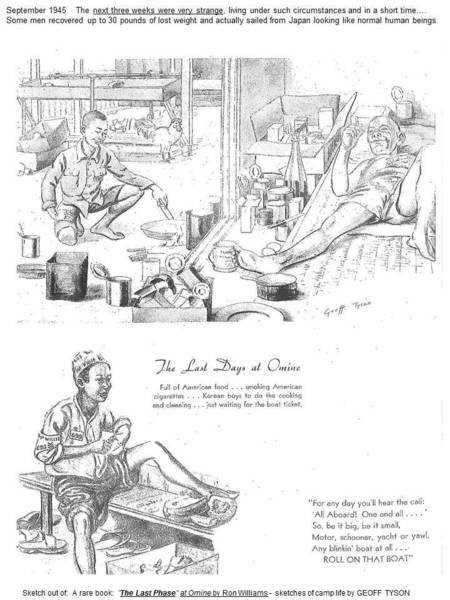 The conditions of the camp were very bad, sick men were made to work surface jobs and soldiers had to be particularly sick to get a Yasume. Fortunately morale in the camp was excellent and I am sure this accounts for our low death rate. I attribute our high morale to the men who took great risks in collecting war news and to those who organised and took part in concerts and our sing-alongs. News was coming through the Japanese papers, describing a new super bomb, the Atomic Bomb and eventually we had news that the war was over, we knew something had happened because we were given a rest day. The worst and most violent guards had disappeared and we knew we were liberated. A week later planes flew over us, we put up signs and signalled to them with mirrors and food parcels were dropped to us. A lot of men went very silly drinking alcohol and I remember 6 died from drinking wood alcohol. Fancy suffering for so long and then to die in such a silly way. We wandered everywhere in the local area and the civilians were afraid of us, but eventually we had them doing work for us. The next 3 weeks were very strange living under such circumstances and in a short time some men recovered up to 30 pounds of lost weight and actually sailed from Japan looking like normal human beings. I sent Denny and 3 others back to Saganaseki to retrieve the ashes of 3 men we had to cremate there it took them a week to persuade the head of the Copper smelter to release the ashes, but eventually Shinto Priests presented them to us in urns covered with white cloths. We were very moved by this gesture. We left Omine and travelled to Nagasaki where the atomic bomb had exploded we had heard about this large bomb but we were not prepared for the utter devastation we saw. Several of our 2/40th blokes had been within 500 metres of the bomb blast. 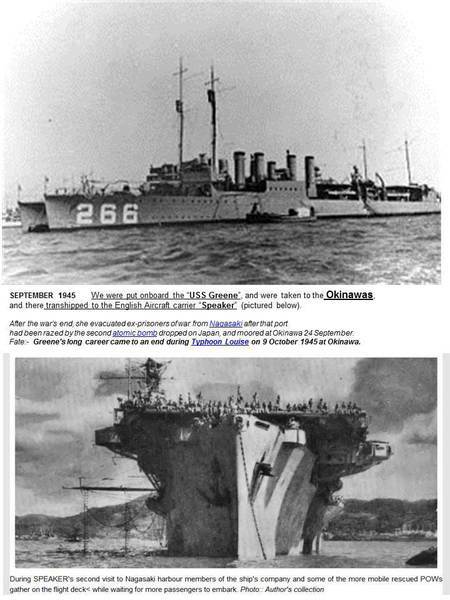 We were put on board the USS Greene and were taken to the Okinawas and there transhipped to the English Aircraft carrier Speaker. We sailed for home via Hong Kong, where we spent 2 days, then onto Manila for 2 weeks in medical quarantine before finally sailing for Darwin early October 1945. I arrived home very thin and had a deep sore on my left arm. I spent some time in the Evandale Hospital recuperating, and as part of my therapy made a lambs wool toy lamb (which became a favourite toy for my children and named him “Aloysius”). My recollections of the Japanese were they were like alien men from another planet, they were strange, inhuman men. The guards were little better than criminals and treated their prisoners with great contempt. Fit and able men were not allowed to carry the sick, other sick had to do it. The Japanese in Kyushu were far more friendly and not driven by the beliefs of Bushido and Sumarai, Japanese military warrior codes of ancient times. We had to work alongside Japanese men and women little different from ourselves. 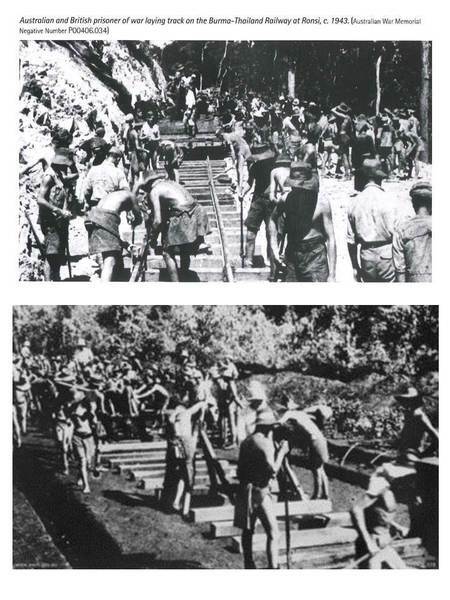 The construction of the Burma Railway is one of the most amazing achievements of the war, taking twelve month to build through 415 kilometres of dense jungle, .they say a prisoner died for every sleeper laid. There were 61,000 prisoners of war and 270,000 civilians who laboured for the Japanese and of those 13,000 Dutch, British, American and Australian lives were lost along with 70,000 Asians, 2,646 Australians died. We had few mechanical aids whilst working and apart from the use of a few elephants the work was done by men using dynamite, picks and shovels, primitive pile drivers and using carry baskets to take the rocks and rubble away. 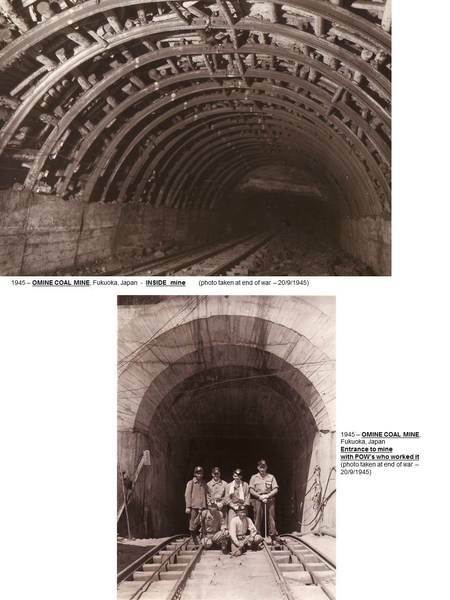 The railway was not in use long after its completion because Allied bombing destroyed bridges along its route so parts of the railway could only be used. 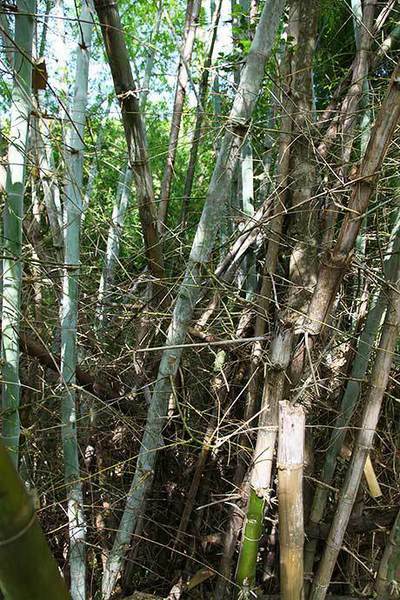 It amazed us how many uses we could find for bamboo, we used it to make beds, brooms, brushes, baskets, water-piping, tubing and splints. We unravelled our kit-bags to obtain threads and used razors, pocket knives, butchers’ saws and carpentry tools as surgical instruments. We ate snakes, dogs, rats and snails along with lentils and jungle spinach. These of course were added tour rice rations. 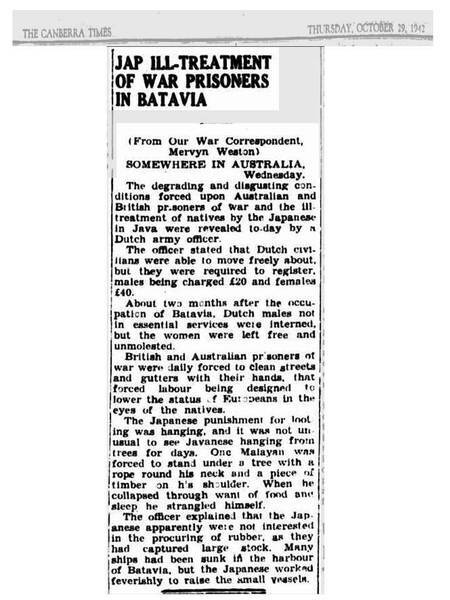 “as we had been under the care of the Japanese, they were bound not to pay”. I thought this was disgraceful treatment. 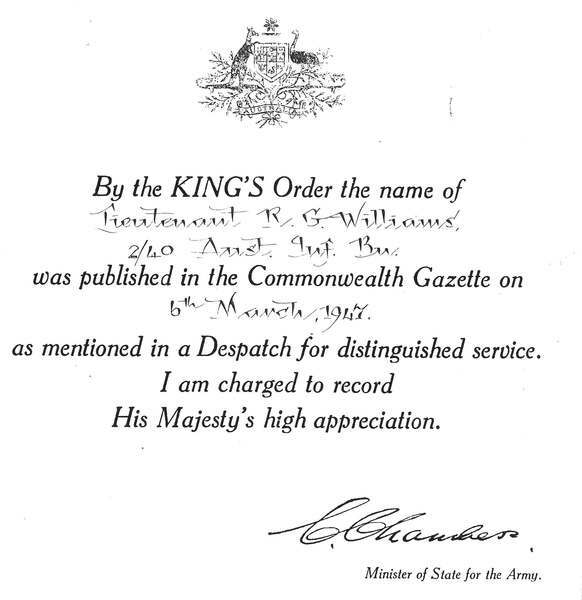 My grandfather was Mentioned in Despatches after the war and was one of only 2 members of the 2/40th who were recommended to receive a Military Cross for dedicated service and leadership. He died on 21st November 1977 after having contracted cancer. He had led a busy, happy life. Had a happy marriage and raised four children. He suffered continually from bouts of dysentery and recurring malaria. What it must have felt like to return home in 1945 to see familiar faces, to hear only English spoken, to eat your favourite foods and drink a cool beer. To sit and gaze at the stars without longing to be at home with loved ones and to make plans for the future. 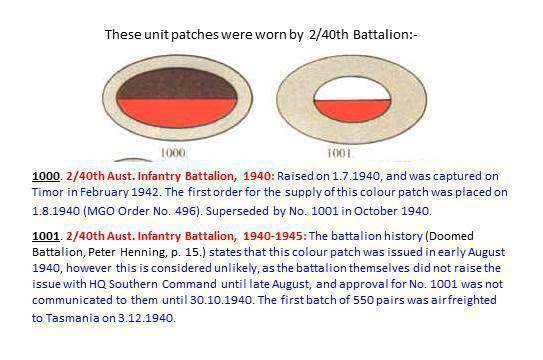 A great deal of the research for this study came from the “Doomed Battalion” which is a comprehensive history and analysis of the 2/40th. When I commenced this study I thought the title for this book was curious but after early study of the book it was obvious why. 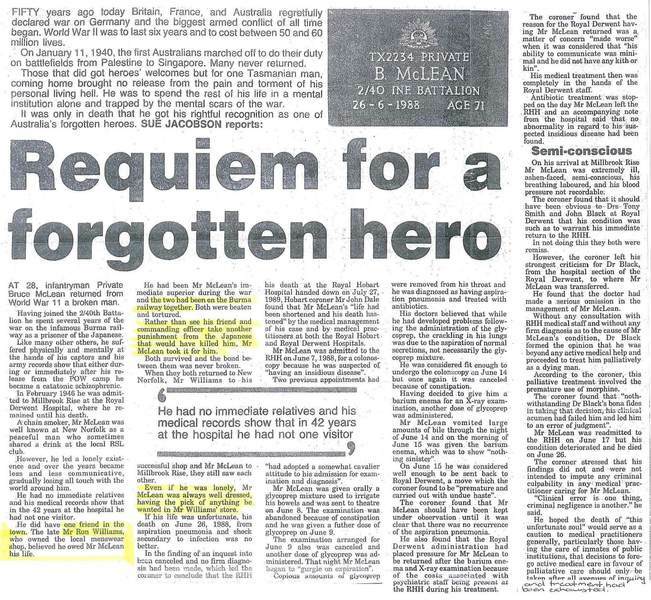 This was the story of a battalion of mainly Tasmanian soldiers, poorly equipped and poorly prepared who were assigned a hopeless military task within a misguided strategy. 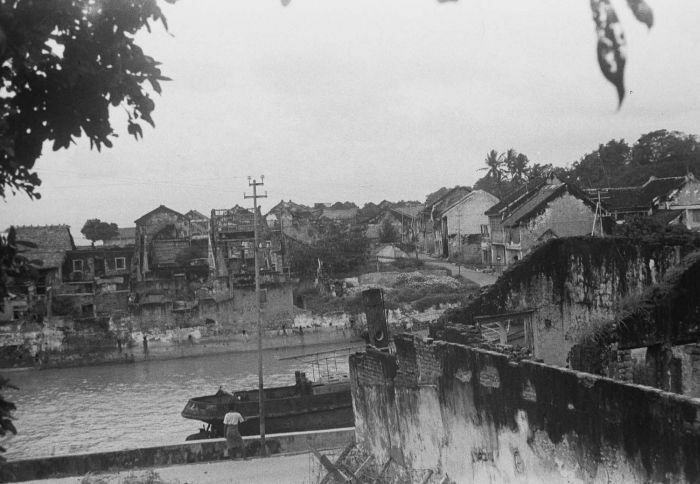 The men were captured only a week after the fall of Singapore and only after 2 or 3 days in defence of their positions from the enemy. They were doomed before they left Australia and within a short time were doomed to three and a half years of horrific captivity in prison camps scattered throughout Asia. seemed to consider it quite applicable after being landed up here”. “I don’t want your money, you belong to a doomed battalion”. That story was soon squashed by the officers as being bad for morale. However, it was all a joke, he only did it for a joke. Nevertheless, the story obviously stayed with the battalion and the men felt that their training conditions in the desert of northern Australia made them feel as if they were doomed to an uncomfortable war. I was intrigued by this coincidence in the title to the book. Was it a coincidence ? I wrote to Peter Henning and although he has not written back I did speak to him and he informed me that although he was aware of the poem, that was not the reason he so titled his book. I wonder ? 4. Programme for the stage play A Bright and Crimson Flower, written by Richard Davey and performed by the Zootango Theatre in Hobart, October 1992. 5. Williams, R.G., Diary of war memoirs. 6. 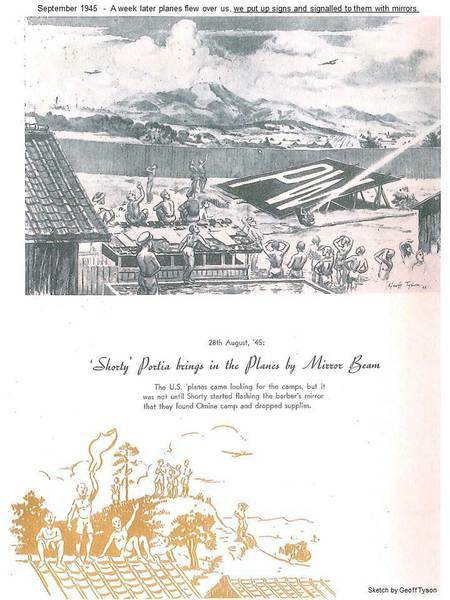 Tyson, Geoff, Oesapa Besar and other remnants, privately printed, 1947. 7. Tyson, Geoff, ‘The Last Phase’ at Omine, privately printed, 1947. 1. Williams, R.G., private letter to Dorothy Wardlaw. H.M.S. Speaker, Hong Kong, 28 September 1945. 2. Mr Dennis Scanlon, conducted 7 May 1995. Ron was born on 7 August 1920 at his parents home in Derby, in north-east Tasmania. school, then went to work to help support the family. Dorothy Annette Wardlaw. They later became engaged. Tasmania, of whom the majority of those enlisted were in their twenties). 14-16 April 1941 Banka Banka; No. 3 Bore; Larrimah, then onto Katherine, N.T. 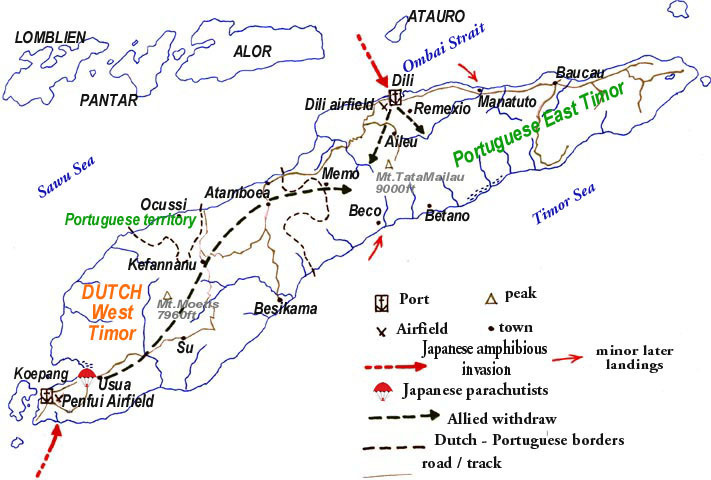 25 December 1941 Received word the Japanese were preparing to attack with some force. troops and ammunition to defend the island. a gun, they arrived with old South African Boer War equipment. "they would look after the natives and told them to kill the white officers"
We heard that other platoons had suffered severe casualties. We were outnumbered 3 to 1.
to destroy a machine gun post. food were at Babau, which had been cleared of Japanese. paratroopers and pushed through to Airkom. We were captured and taken to a Prisoner of War Camp. keep my platoon together as best I could. Dilli, and were taken to Suabaya on Java. 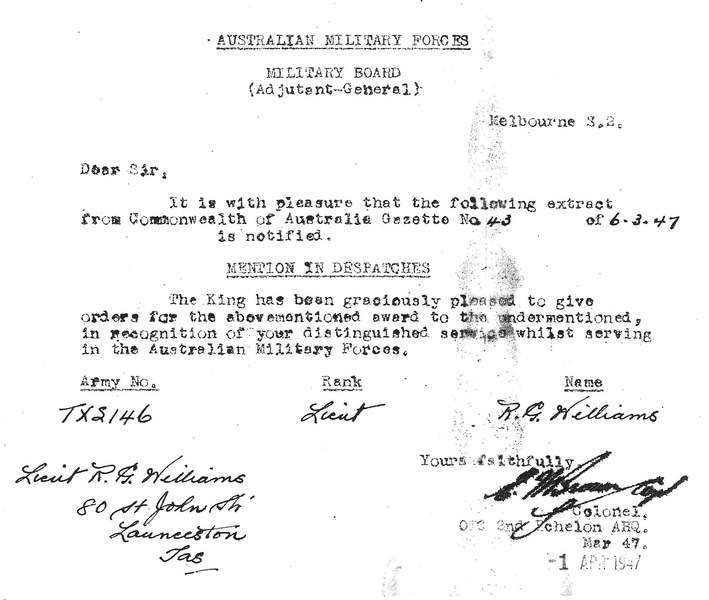 1 October 1942 Arrived at ‘Batavia’, taken to a large POW camp Tandjoeng Priok. dysentery and the weather was bitterly cold. my men was being unfairly treated. 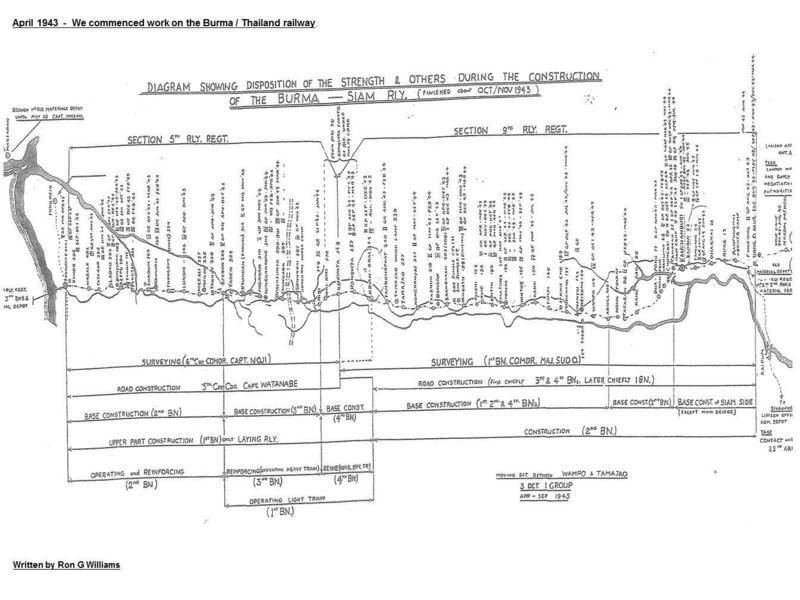 We commenced work on the BURMA-THAILAND RAILWAY. Cholera hit us here at Jungle One, a lot of men died. lashing out for no reason with beatings and confinements. 17 October 1943 Thank GOD! the line finally joined. still fit enough and good enough to beat the opposition – which they did. 1 November 1943 We ran an imaginary horse race for Melbourne Cup day. south to our sick men – the men were very grateful and it gave them some hope. as the Commander made us make him a duck pond. groups and taken to Singapore. 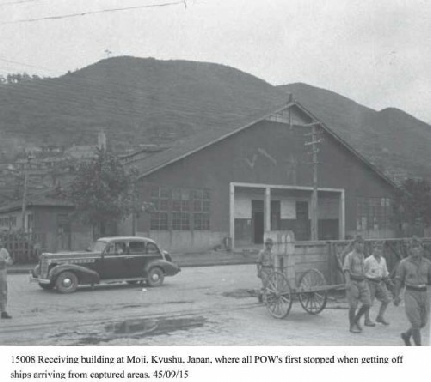 late June 1944 Arrived at River Valley POW camp. were torpedoed, and we were hit by a typhoon). there was only a couple of dozen of the 2/40th men together. We were taken to Saganoseki, to work at a copper smelter. in Kawasaki - OMINE Coal Mine - this was a terrible place. were 2 bombs - Hiroshima and Nagasaki). men we had to cremate there. 19 September 1945 Recovered from POW Camp, Fukuoka No.5, Kawasaki. October 1945 Finally arriving into Darwin. – not knowing if Dorothy was still waiting. 22 November 1945 Married Dorothy Annette Wardlaw. Battalion who were recommended to receive a Military Cross, for dedicated service and leadership. 21 November 1977 died from cancer. and published in full in the Personal Stories section. Other information and pictures sourced by Julianne T Ryan. 7 July 2014. An ordinary man who endured extraordinary brutality and survived to come home. Remembered always with great love and pride by Peter (son) & Jill - their children and grandchildren. Showing 4 of 56 images. 1945-9-6 - The SURRENDER of "ALL JAPANESE FORCES"
1945-9-6 - The SURRENDER of "ALL JAPANESE FORCES" in NEW GUINEA, NEW BRITAIN AND THE SOLOMONS, by General H Imamura.